Matt Vaughan gave up a 9-5 job to chase his pro poker dream and now documents it all on his vlog. 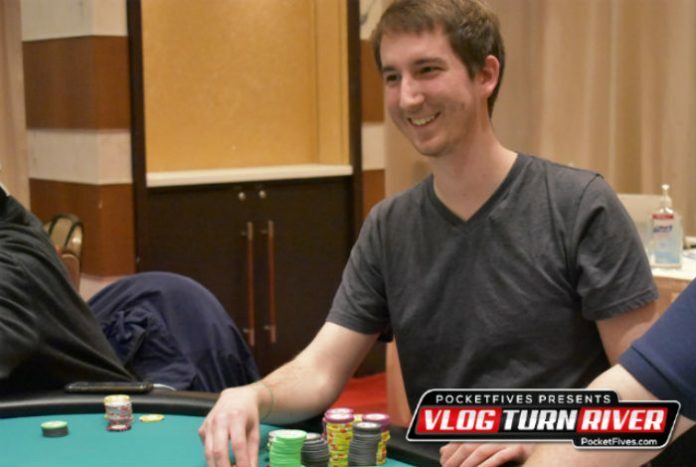 Matt Vaughan brings a technical side to the poker vlogging game. The former healthcare software employee started his vlog in January 2017, two months after leaving his job in Wisconsin. Vaughan works three jobs in his new home in Baltimore, MD. He plays, teaches, and vlogs poker. “I decided on a whim that this would be a cool time to document life and this was a cool way to do it,” Vaughan said. The game became more than a hobby to Vaughan in 2012 when the Cleveland Jack Casino opened its doors in the same city where he attended college. Live poker turned into more online play and Vaughan continued to explore his learning process with the game as he found new elements. When Vaughan prepared to leave his job, he already was working with an online training site called School of Cards. Using Andrew Neeme and Brad Owen’s vlogs as inspiration, Vaughan left his job in the corporate world and immersed himself in a life he spent half a decade subliminally preparing for. The sense of purpose drives Vaughan to surround himself with poker in all parts every day. Vaughan does not have a specific schedule for when he plays cash games but attempts to put in at least one session per week. Those sessions tend to include $2/$5 and $5/$10 cash games. Vaughan frequents the Beltway cash rooms, predominately Maryland Live!. Viewers can also find Vaughan on the tournament trail. Vaughan took part in the Borgata Winter Poker Open in January and produced content related to his summer at the World Series of Poker. In between the lull of sessions and tournament runs, Vaughan compiles hand reviews and general tips for viewers. The training side of his mind is apparent as he explains the reasoning behind topics that jump from preflop raises to table etiquette. The amount of content at Vaughan’s disposal is a detail he tries to limit. By filming every session or tournament, it increases the time before the video hits his YouTube channel. Vaughan notes that he has gone through periods where his publishing rate cratered. He rectified that by creating videos that were more recent instead of four weeks prior, as he had done in the past. The menial part of shooting and editing are obstacles that Vaughan overcame to ensure he could update his channel on a consistent basis. “I’ve gotten better at forcing myself to do the less enjoyable parts of the process. If I’m going to do the boring parts, it better be worth it,” Vaughan added. The relationship Vaughan has with School of Cards allows him to not feel the pressure of having to make his primary income through poker. Vaughan played at Borgata for two weeks and used his time there to initiate content involving the tournaments. If he had a preference, though, Vaughan would choose cash games as his video base. The technique of using his smartphone to film gives Vaughan pause. During last summer’s WSOP, on rare occasion would Vaughan film during the tournament itself. The 9,300-plus subscribers of Vaughan allow him to take in a small income from his vlogs. That money goes into a proverbial piggy bank for Vaughan, who does not see an immediate road to the vlog becoming his sole source of income. The growth of Vaughan’s vlog is apparent on his page where the production value and details improve with every piece. You might see Vaughan on your direct left in the near future. A sponge who rings out his knowledge for the masses.